The doc premieres Nov. 28. From left: David Hume Kennerly, Matt Blank, Gina Bennett, Sr., Cofer Black, Susan Zirinsky, Chris Whipple, Jose Rodriguez, Jules Naudet and Gedeon Naudet. Credit: Paul Morigi/Getty Images. Showtime and CBS News co-produced documentary The Spymasters: CIA In the Crosshairs takes on added relevance as the debate about the role of surveillance in a free society grows following the terrorist attacks in Paris. The two-hour Mandy Patinkin-narrated documentary, which premiers on Showtime Saturday, Nov. 28 at 9 p.m. ET/PT, takes a look at CIA’s intelligence operation from the inside. The 12 former CIA directors who are still alive were interviewed for the documentary, participating in discussions that touched on the darker side of U.S. CT operations like torture and the CIA’s secret prisons, as well as past failures. 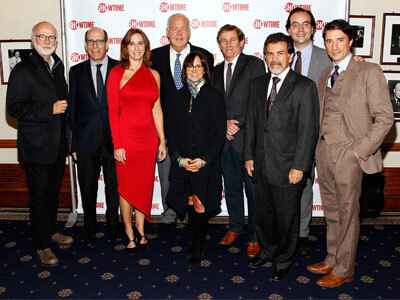 At the private screening of the documentary last night at the National Press Club, guests included: executive producers David Hume Kennerly and Susan Zirinsky; directors Jules Naudet and Gedeon Naudet; writer Chris Whipple; Matt Blank, chairman and CEO of Showtime Networks; senior CIA counterterrorism analyst Gina Bennett; CBS News justice correspondent Jeff Pegues; 48 Hours correspondent Susan Spencer; and Jose Rodriguez, former head, CIA Clandestine Service.